The Dakota State Athletic program currently finds itself at the halfway point through their fall season. The football team heads into their bye week at 5-2 overall and 3-1 in the conference, and are coming off a 59-20 thudding of Waldorf (IA). Jacob Giles led that charge by completing 18 of his 25 passes for 283 yards and 5 touchdowns. That stat line earned Giles Conference Player of the Week for the third time this season. The Trojans received votes in the NAIA national football poll, and are sitting in the second spot of the conference standings one game behind Dickinson State, who are unbeaten in conference play. 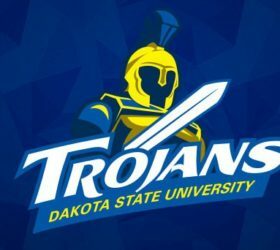 This could potentially set up a game with huge playoff implications when Dickinson State travels to Madison to take on Dakota State on October 28. The Trojan football team takes this week off and will return to action on October 21 when they travel to Valley City State (ND). The volleyball team has 12 matches remaining on their schedule following a weekend of house cleaning as conference and nation leading Viterbo (WI) swept the Trojans in three sets. The Lady Trojans bounced back however, as they swept Waldorf (IA) the next night in three sets. 23 games in and the Lady Trojans sit at 5-18 overall and 3-5 in North Star Conference play. They are currently tied for 6th place with Presentation (SD), 4.5 games behind the nation’s best, Viterbo (WI). Senior Carly Rozell leads the girls in Aces at 31, and Kills at 212. Fellow Senior Rachel Johnson leads the team in Assists, while Sophomore Mallory Testerman leads in digs at 185, and Junior Kaylee Spreier leads in blocks at 75. The Lady T’s travel to Valley City State (ND) for a conference battle on Wednesday, October 11, and then return home for a non-conference matchup against Grace (NE) on Friday the 13th, and then conference foe Bellevue (NE) on Saturday, October 14th. Postseason Volleyball will begin on November 10th at a time and place to be determined later. The Men’s and Women’s Cross Country teams ran over the weekend in their fourth race of the year at the Briar Cliff Invitational at Briar Cliff (IA). The men placed 12th out of 14 teams, while the women placed 10th out of 13 teams. The Men’s team was led by Sophomore Maxwell Cruse, who posted a personal record time of 27 minutes and 5 seconds and placed 25th in the race. Another runner for the men’s team who posted a personal best was Freshman Mattheu Cox who posted a time of 31 minutes and 3 seconds. As for the Women, they had much of a similar day as two girls posted personal bests. Freshman Jacia Christiansen clocked in at 20 minutes and 51 seconds for her PR and her freshman teammate Andrea Bryant finished in 21 minutes and 34 seconds. Jacia’s time was good enough for 38th place, while Andrea came in at 57th. The two teams will travel to Yankton, SD for their regular season finale at the Mount Marty (SD) Invitational on October 21. The race will serve as a warmup for their Conference Championship race hosted by Jamestown (ND). Can DSU Compete with USD and Macklemore?